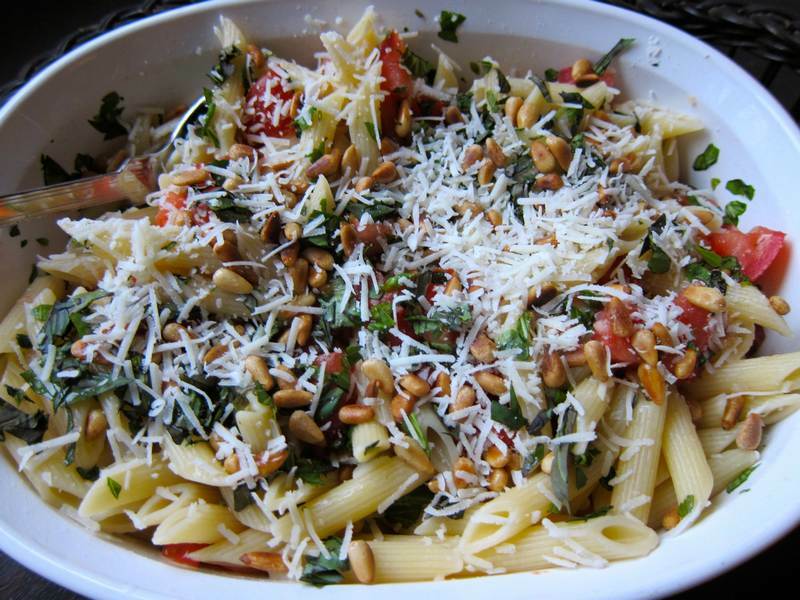 Tomato Basil Pine Nut Pasta- Happy St. Paddy’s Day! How is it that some people are so sure of what they want that they seemingly make a straight line getting to their goal, while others zigzag about searching for their pathways? Have you decided what you want out of life? Or, are you willing to be surprised and to see what life has to offer? Whether you move straight or zigzag, the recipe for success lies in taking action and advancing towards the goals you set. And the marvelous thing about adopting new goals for yourself as you age is that you can remake your life in new and interesting directions–like my good friend Myra Aizer Goldberg, who is just now studying hard for her bar exams, graduating from law school two years ahead of her daughter. This Jittery Cook blog has caused me to redirect my life. Thanks to Barbara Eiswerth for helping my Jittery Cook persona get closer to the goal of sharing fabulous recipes. We can reinvent ourselves, so why not reinvent pesto? 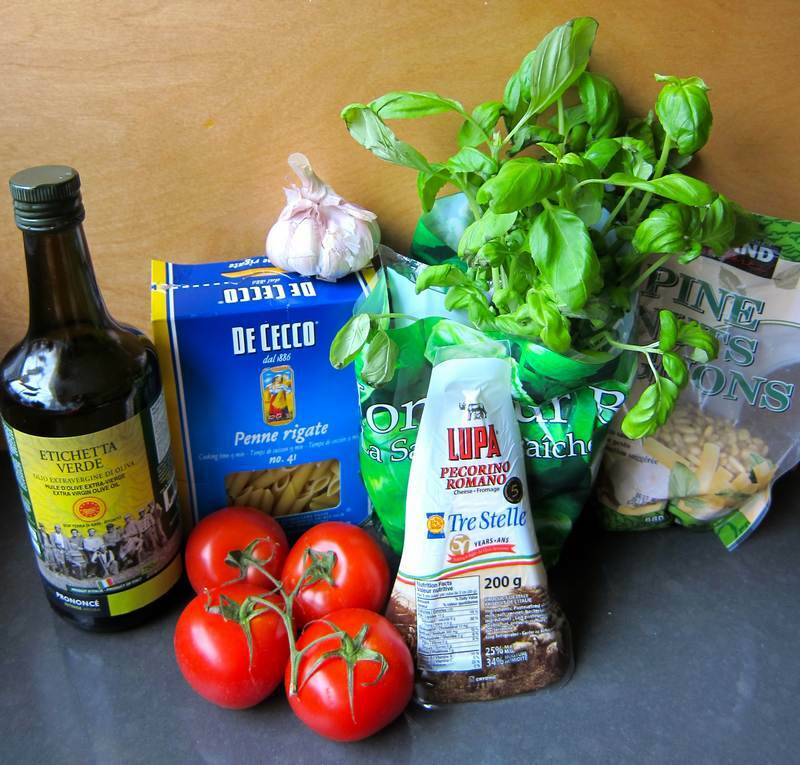 Combine all ingredients, except the cheese, with the strained pasta. 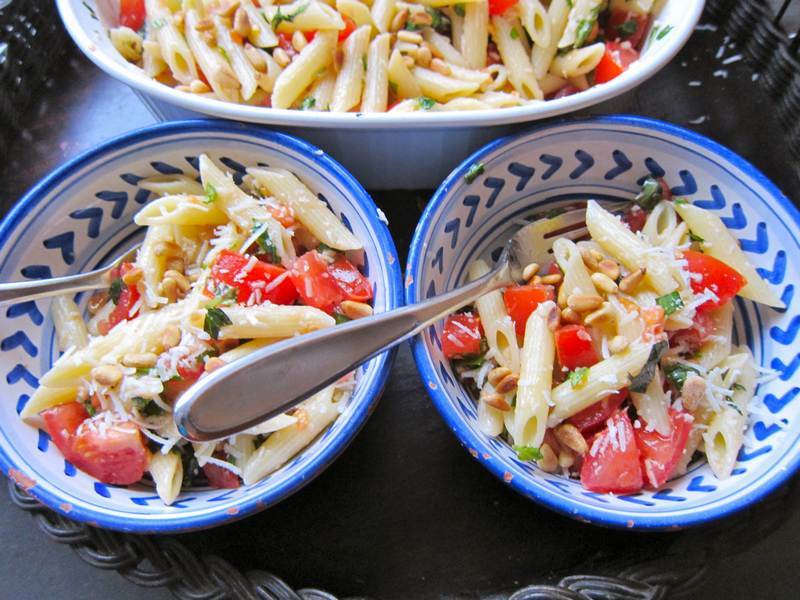 Serve straight away with a mixed green salad adding the cheese at the last minute. 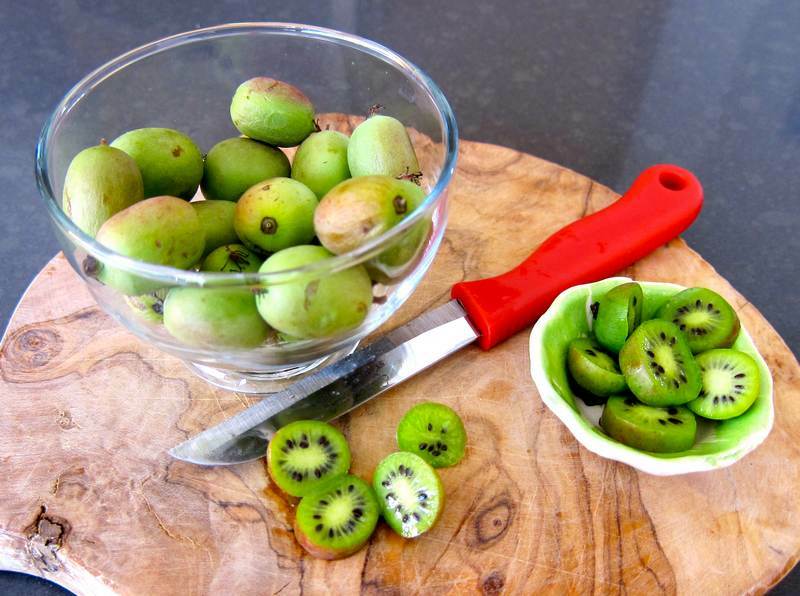 How about these kiwi berries for St. Patrick’s Day dessert? Even the kiwi has decided to take a new path! The soon to debut web site Momentum University will guide you in achieving the goals you set for yourself. Got any New Years resolutions that you’ve left dangling? My book club is about to discuss ‘A Mountain of Crumbs’ by Elena Gorokhova. It is based on Elena’s story as a young Russian girl who knows very well what she wants out of life. Her writing is hilarious, poignant and touching. FYI Barbara Eiswerth came all the way from Oregon to prepare wonderful meals at El Encanto yoga retreat. See the Portobello Mushroom Burgers with Chipotle Mayonnaise post for another Barbara treat. See photos of El Encanto and setting up for a picnic and yoga at Secret Beach below. Holly, this time you really outdid yourself. My cookbook consists of all your recipes that I share with family and friends. I can’t wait to share this one. It looks fabulous. Thank you, thank you and keep on jittering. This is my kind of dish!! Definitely going to try this! Thanks again, Holly for yet another great recipe! So glad you approve! The tomatoes should be the best tasting you can find. Hi Holly, your friend Cheryl keeps forwarding these recipes to me and they are so inspiring that I subscribed to your blog. Made this tonight and it was amazing. Thanks!!! So glad you liked! Welcome to my Jittery world. I just made it for dinner and it was delicious. For my taste I needed to add a bit of salt and ground black pepper, but it really was excellent. Thanks!! So glad! Did you find really tasty tomatoes? I had this the first time in Mexico and of course the tomatoes were perfect.